About 100 miles northwest of Florence lies a ruggedly beautiful region where UNESCO-listed medieval towns perch on dramatic seaside cliffs. This tour lets you take in the area’s highlights, including the centuries-old villages and breathtaking landscapes of the Cinque Terre National Park. Accompanying you will be an expert, English-speaking guide, whose knowledge will deepen your appreciation of these remarkable destinations. You’ll begin your journey on your train departing at 6:00 a.m. from Rome Termini, where you’ll meet your group and our greeter. The greeter will help you get to your train. You'll reach La Spezia in just 3 hours and is the gateway to the Cinque Terre Villages. In La Spezia you'll be met by your guide. You will board the trains of the Cinque Terre region and embark to your first stop Monterosso, the largest of the five coastal villages. Located on hills cultivated with vines and olives, its famous for its amazing beaches, beautiful reefs and crystal clear waters of the sea. It is dominated by the ruins of hte casetle and characterized by typical narrow medieval streets with multi-colored terraced houses. At the local markets you'll have a chance to tase some of the most delicious foods of the Ligurian Riveria. 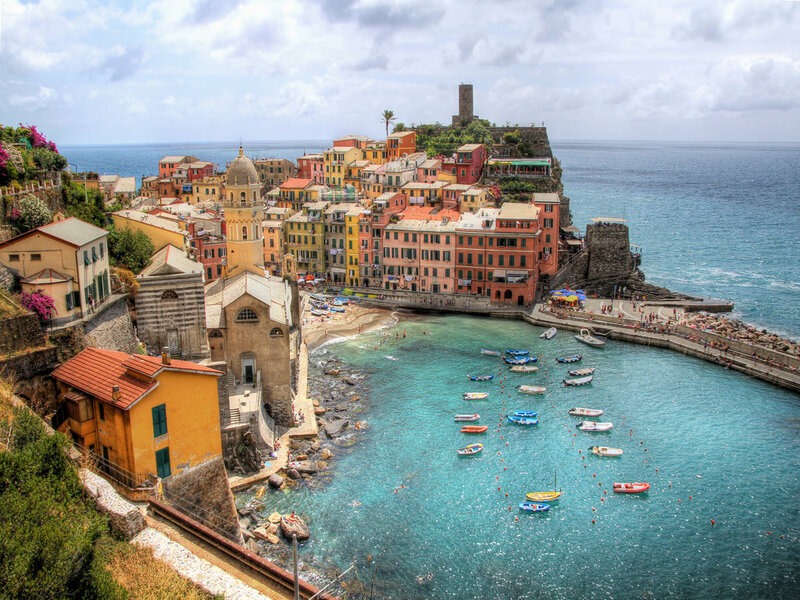 Vernazza, is a small fishing village and is probably the most characteristic of the Cinque Terre villages and is classified as one of the most beautiful villages in Italy. From Vernazza you will board the ferry to admire the island of Corniglia, located in the middle of Cinque Terre nad is only 100 meters above sea level. Arriving by boat to Manarola, built high on a rock 70 meters above sea level on the ofhte most charming and romantic of the villages. The tiny harbor features a boat ramp, picturesque colorful houses, a tiny piazza with seafood restaurants and cafes. Upon boarding your train in Manarola for your final stop in the Cinque Terre villages is Riomaggiore, the southern most village. Please note that the ferry ride to Cinque Terre will occasionally be affected by adverse weather and sea conditions. If you are predisposed to motion sickness, please take necessary precautions before your journey. Good walking shoes. The tour includes both hillside paths and stairs.